Let’s face it: there’s room in everyone’s hearts for Clue, whether you’re referring to the board game on a rainy afternoon or the classic 1985 movie, complete with Tim Curry’s manic “solve every puzzle in every way possible” sequence at the end for the film. So it’s no surprise that Electronic Arts has adapted the board game for the iPhone and iPod touch. A bit of a departure from the board game, Clue has you taking on the role of an investigative reporter attempting to uncover the suspect, location, and weapon used to murder Mr. Boddy after a party in his hillside mansion. Once enough evidence has been gathered, you can call your editor and formally lodge an accusation, naming the killer, location, and murder weapon. Then you move on to the next scenario. 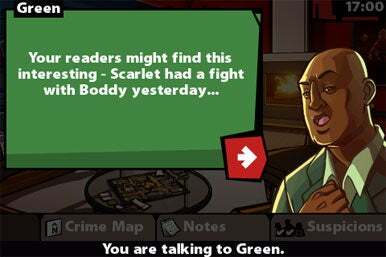 Green Screen: In Clue, you interview suspects—like the talkative Mr. Green—to figure out the name of the murderer, the location of the crime, and the weapon used. Clue for the iPhone centers around sleuthing. You explore rooms, gather clues gathered, and interview suspects within a given amount of time to make the deadline and earn points toward the next level. Additional tools such as a note pad and suspicion list help you corral the list of available suspects, locations, and weapons into a more manageable order; you can always recheck your notes or call your editor for help along the way. A combination of great graphics, good sound, and a nice use of the iPhone’s interface make the game inviting. The controls are quick and responsive and you can easily tilt the device to pan around a room. Other bells and whistles such as an auto-save feature, good randomization of cases (so an end result can’t be memorized), and solved/unsolved case statistics make the game fun, but there are some shortfalls to consider. This is a sleuthing title with a designated time limit, and the concept usually works. But when it takes as much time to check out a plant in a room as it does to walk across the house or hold an extended interview with a suspect, the time element feels out of whack. The game itself tends to be a bit hit or miss. While Clue looks and sounds good and performs well under iPhone OS 3.0, the clues themselves can border on the cryptic, making the game frustrating, especially to a novice or younger player. A lack of additional levels—there are only 10 cases to solve—as well as a multiplayer mode makes the title feel isolated. It’d be nice to see Clue gain either Internet or Bluetooth-based multiplayer features. Clue stands as a marquee title for the iPhone, and as such commands a $5 price tag at the App Store. With a few revisions and multiplayer functionality, the game would be well worth the cost. But while there’s plenty of potential here, the mysteries of Clue don’t offer much intrigue. Clue is compatible with any iPhone or iPod touch running the iPhone 2.x software update.